It occurred to me that a lot of actors and actresses out there have been Hollywood royalty for years, living off the few iconic roles they've played. So using my amazing abilities (internet) and near photographic memory (IMDB) I shall begin reviewing these cinematic giants. 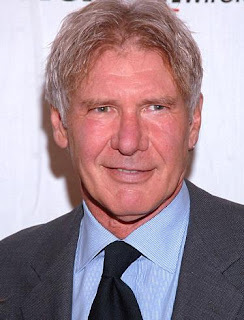 Today we look at Harrison Ford. I loved him as Indiana Jones and Hans Solo, but that doesn't excuse him from the horrible movies he's participated in. In order to properly evaluate him, I put aside bias, and looked at the movies. I don't count 'made for TV' or television guest spots. Obviously, bias can't be completely factored out, so to be fair I would say there is a 2-3 +/- percent margin of error based on preference. Now then, as Mr. T would say, enough jibberjabber, show me the chart. As you can see, the amount of bad movies he's been in clearly out weighs both the good movies and the ok movies if standing alone. However since I consider the 'ok' movies to not be considered 'bad' just not great, I feel they still fall into the positive side for Harrison. 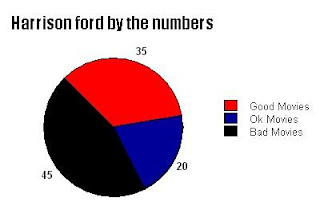 Thus by a slim 55% over 45%, Harrison Ford is officially a "Good Actor." However if continues his current downhill trend that balance could easily tip in the other direction. Something to consider when deciding whether or not you want to see 'Extraordinary Measures' in theaters. What??? you mean the Indy remake did not vindicate him?